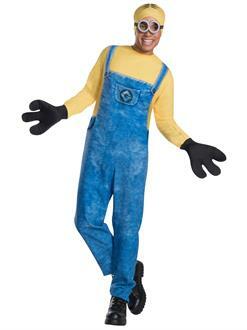 Stand out amongst the crowd and crush the costume contest with the Mens Minion Dave Costume. As Dave from Despicable Me, you can join fellow minions Jerry and Mel for the next adventure. Helping Gru’s evil schemes is a full time job that requires the proper ensemble. This costume comes with a comfortable jumpsuit for any action, gloves to put evil in your hands, and goggles and a headpiece to complete the look. As this kooky yellow creature, you’re sure to stop traffic wherever you go this Halloween.